I suspect it has been four or five years since I last visited Bear Creek. While undergoing physical therapy for my sprained MCL, I met a young physical therapy aid named Hayley. In the course of conversation I learned that she and her boyfriend Doran love fly fishing, and on my last visit she obtained my mobile number, so she could share it with Doran. Several days later I received a text message from the aforementioned Doran, and we agreed to meet on a local stream. Doran suggested Cold Spring Gulch on Bear Creek as our meeting place between 9 and 9:30 on Monday morning, and our text message exchange became a bona fide plan. As I drove west on CO 74, I noticed a sign for Cold Spring Gulch, but a parking area was not obvious, so I continued on to Corwina Park, where I immediately texted Doran to let him know my whereabouts. Doran arrived at Corwina Park by 9:30 on Monday, and after I strung my Orvis Access four weight, we were on our way. 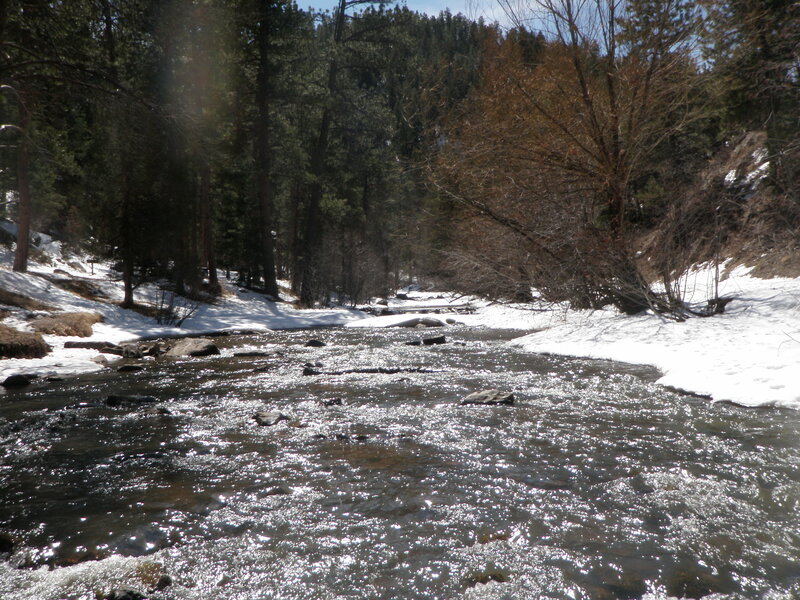 The temperature was in the upper 50’s when we began, and the flows were a bit low at 20 CFS but very clear for late April. We hiked downstream along the shoulder of CO 74 to the bend where Cold Spring Gulch entered Bear Creek, and then we descended a steep bank and crossed the creek below a cyclone fence with several very visible no trespassing signs. Doran occupied a gorgeous long deep pool, and I continued downstream to a point where a large rock wall jutted into the creek. I began with a yellow fat Albert and trailed a single beadhead hares ear, and I covered quite a bit of nice water before I returned to Doran, who was in the process of moving upstream beyond the private water. 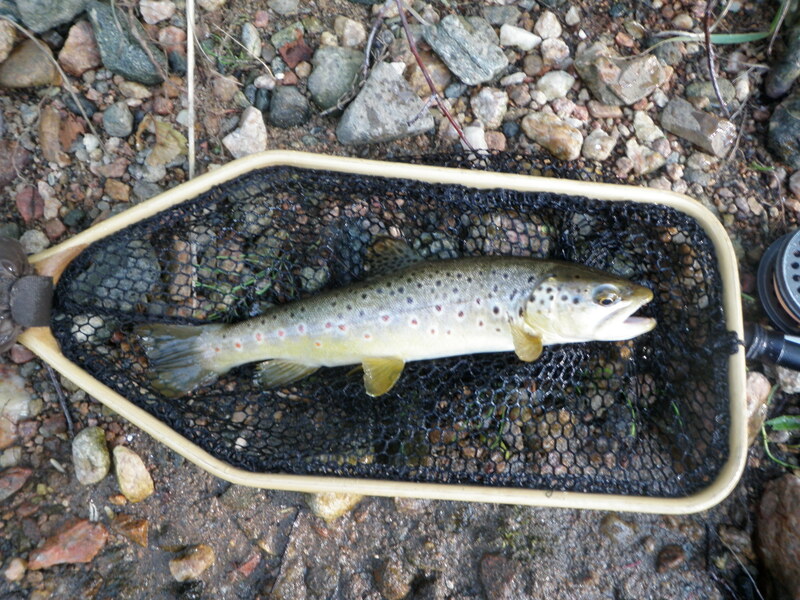 During this early period I landed one nine inch brown trout that grabbed the hares ear in a relatively shallow riffle. The paths along the creek were well worn, so I suspected that the obvious prime spots were pressured over the weekend. 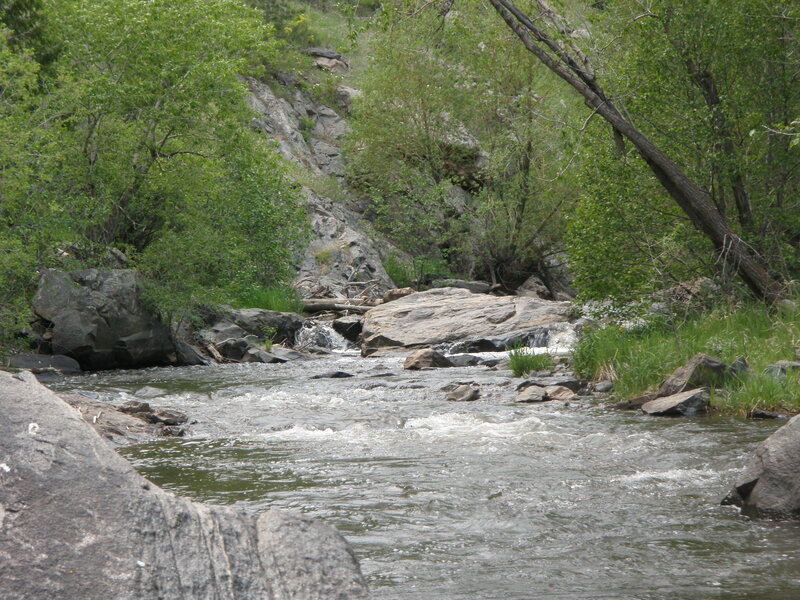 Bear Creek in this area is public water and open to fishing with bait, lures and flies. When I reached the private property sign, I exited and used the main trail to circle around the fenced water until I crossed a bridge. After crossing the bridge I turned on to a fisherman path that led upstream from the bridge pool. Thirty yards above the bridge I found Doran, and we compared notes from our fishing so far. Doran decided to try the dry/dropper method using a large foam top fly, and I presented him with one of my yellow fat Alberts. Over the remainder of the morning we alternated nice deep runs and riffles, and I picked up two more brown trout in the process. Doran also experienced some success, and he became a loyal fan of the fat Albert. At noon we advanced to a point above the parking lot at Corwina Park, and we could see a fisherman ahead of us, so we exited and returned to our cars. I grabbed my lunch and snacked at a picnic table in the park, and then we drove farther west to O’Fallon Park. I wanted to introduce Doran to a new area. We crossed the bridge and parked in the parking lot on the other side of the creek, and then we hiked on the gravel path until we were above another fisherman and just below the bend run next to a streamside restaurant. Doran positioned himself next to the deep run, and he experienced a refusal as his flies drifted next to some large exposed rocks. When he moved up to the prime section, I began casting to the area of the rise. I tossed the fat Albert to a narrow space where a side current curled back to the main flow, and I was shocked when a fish bolted to the surface and crushed the fat Albert. I was certain that the brown trout was the fish that snubbed Doran’s cast earlier, and I landed the greedy little guy and snapped a photo. 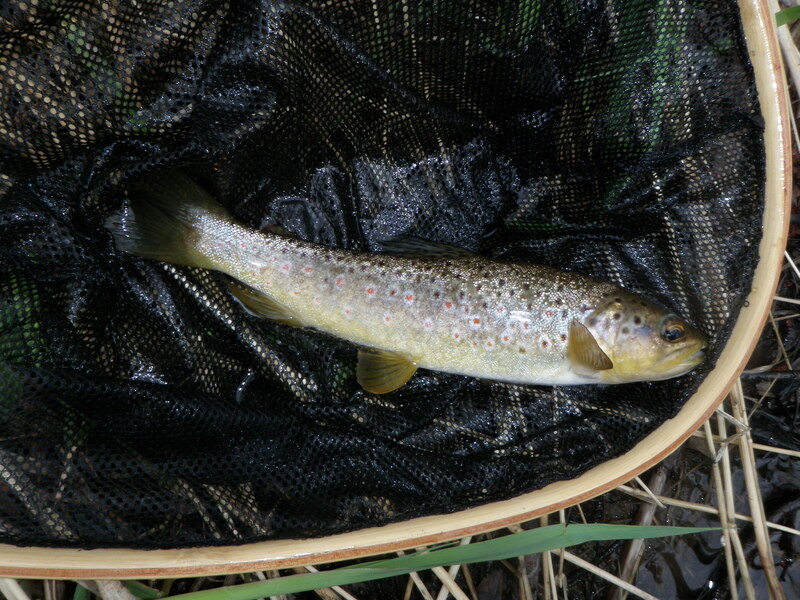 Meanwhile Doran ran his dry/dropper between the faster current and a foam patch, and he observed a pause and landed a decent brown that snatched the beadhead hares ear. We were both thrilled with his success. We continued upstream until we reached the next bridge, and then we called it a day and returned to the parking lot. I landed two additional average size Bear Creek browns during this time, and they both grabbed the hares ear. On Monday four of my netted fish favored the hares ear, one smashed the fat Albert, and one nipped a salad spinner. Doran was pleased with his results, and he vowed to tie hares ear nymphs and fat Alberts when he returned to his apartment. I could not have asked for higher praise from a fishing friend. 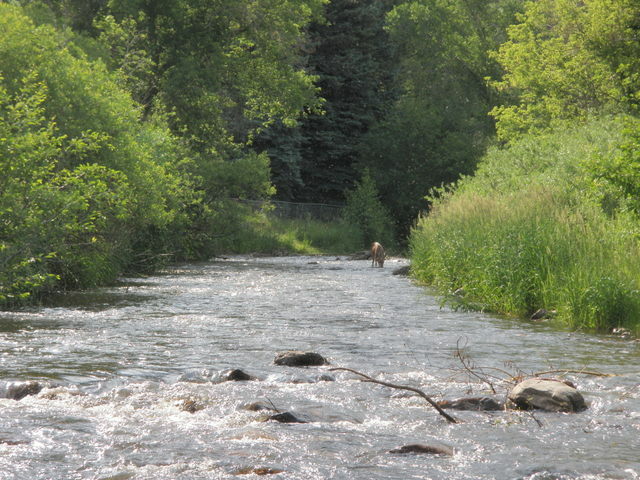 Bear Creek is a small creek, and the fish are rarely longer than ten inches, but the flows were ideal and it takes less than an hour to reach from my house, so that was my destination on Tuesday, July 2. I finished everything I can accomplish for June closing on Tuesday morning and clocked out for the Fourth of July holiday. I arrived home around noon and ate my lunch while reviewing the stream flows. I had a half day to fish so I didn’t want to travel too far. 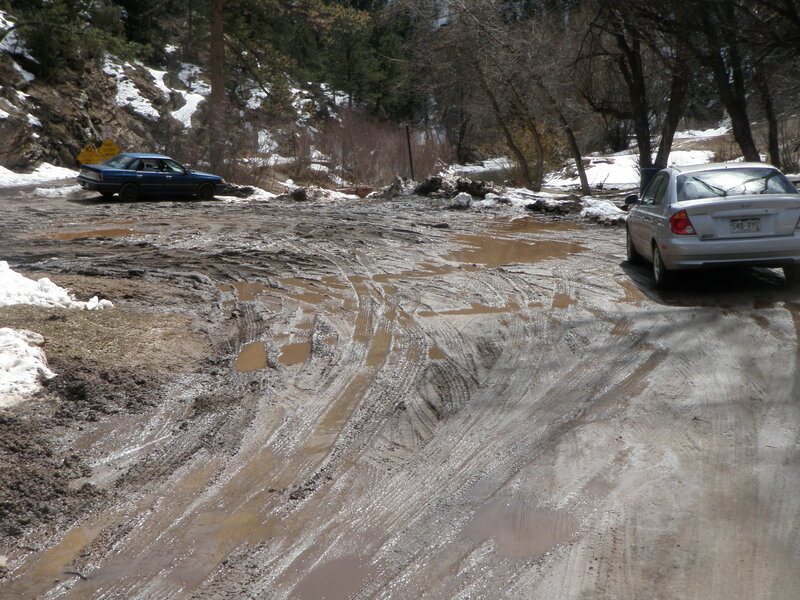 Clear Creek and South Boulder Creek were still running high, and I was saving NF of St. Vrain for Wednesday, so I decided to visit Bear Creek. The flows were 14 cfs, and I remembered that this is close to ideal for the small stream that flows from Evergreen to Morrison and then to Denver. I grabbed the last space in the parking lot at O’Fallon Park and quickly put together my Orvis Access four weight and pulled on my waders and walked down the dirt road that is now barricaded with signs stating that it is a fire lane. There were kids tubing and playing in the stream across from the parking lot so I moved above them and cut in just ahead of some picnickers. I tied on the Chernobyl ant with a yellow indicator and below that I added a salvation nymph. The water I began fishing probably gets pounded as it is in the western part of O’Fallon Park, but I worked it quickly with no more than three casts to promising water. I covered quite a bit of ground with no response, but then in a current seam next to a run the Chernobyl dipped and I set the hook and landed a nine inch brown trout. The rest of my fishing afternoon on Bear Creek pretty much followed this same script. I limited my casts and covered a lot of water and landed the occasional small fish. I had the most success in water with decent depth (2-3 feet) right next to the bank with some sort of cover or structure. 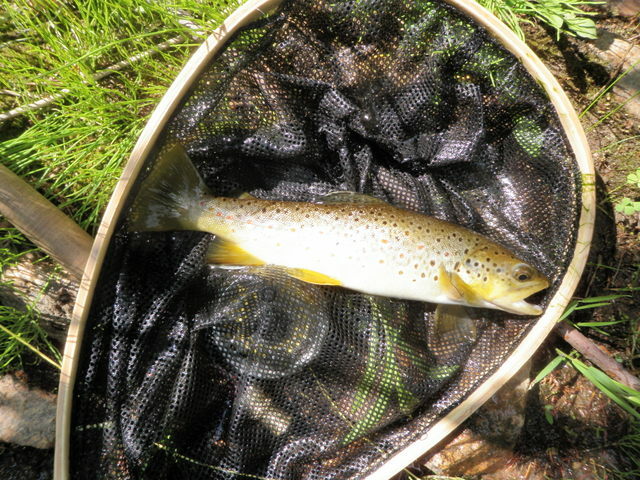 I landed two browns that grabbed the trailing nymph when I fed line downstream and allowed the two fly combination to drift right along the bank and under some overhanging branches. I caught the first two fish on the salvation nymph, but when my success rate stalled I exchanged it for a beadhead hares ear and that pretty much took all the remaining fish. I noticed a fair amount of refusals to the Chernobyl but stayed with it due to its buoyancy and visibility. 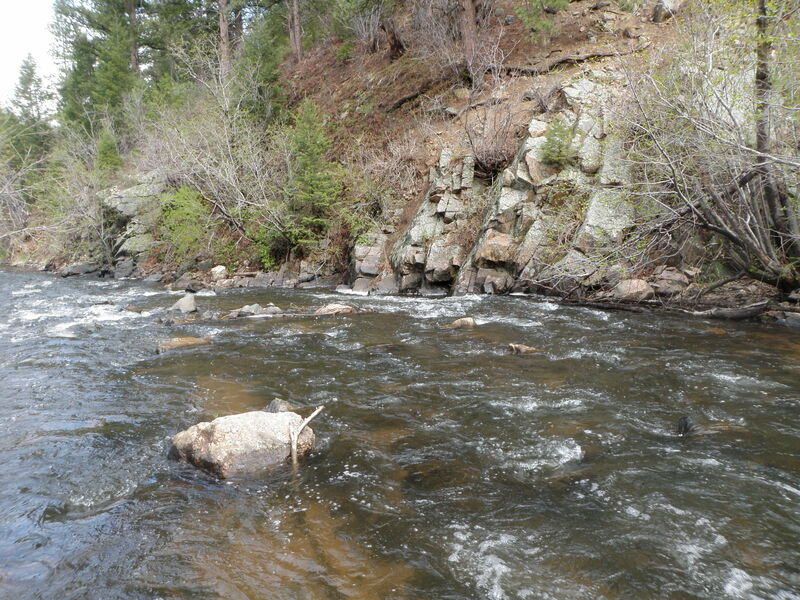 In the nice water next to the restaurant in Kittredge I switched to a size 16 light gray caddis without any success, and I did the same at the nice pool below the bridge in Kittredge. In both cases I managed a refusal but returned to the Chernobyl/hares ear combination for better results. I managed to land eight small browns in my late afternoon adventure, but it wasn’t easy fishing. I covered a lot of water and needed to make accurate casts in tight quarters, and the fish were quite spooky and not tolerant of sloppy casts or reckless wading. A day of catching small trout is better than not fishing at all. I went into work Wednesday morning, but the office manager had not informed me that April was ready for closing, so I took care of a few things and then left my desk at around 11AM. I exchanged Rockies rain checks for a game in August and then stopped at the Vitamin Cottage for a few items. The sky was clouding up as I drove home, but I thought I’d like to try fishing at Bear Creek in the afternoon. Bear Creek was my second choice for Tuesday. I ate my lunch at home and packed the car with my fishing gear. I took off at around 12:30, and as I merged on to I70 the skies opened and dumped buckets of rain. As I progressed westward, the rain changed to hail. In fact there was an inch of hail on the highway as traffic slowed to a crawl with two bare lanes among the accumulated hail. I debated making a U turn, but I decided to check out the stream since I was halfway there. When I exited C-470 and drove through Morrison, I caught my first glimpse of Bear Creek and it looked quite clear so I continued to Lair of the Bear Park. It was still raining pretty hard and there were three fishermen by a truck putting on their rain gear, so I climbed in the back of the Santa Fe to stay out of the rain and put on my waders and boots. The temperature on my car thermometer was 45 degrees so I wore my down vest under my raincoat and used my ski hat under the hood. The rain eased a bit as I began hiking the Bear Creek trail west and away from the parking lot. I hiked perhaps .4 miles to the Creekside Trail and branched off to the left. The trail met the stream at a nice long run and pool. I tied on a yellow Charlie Boy hopper without any wing material as I wanted to use it only as an indicator and dropped a beadhead hares ear off the bend on a 2.5 foot length of leader. In the first deep run I had a momentary hook up as I lifted my rod to recast. I worked my way up the small stream prospecting all the likely pockets, seams and holes. It didn’t take long before I landed a small brown on the beadhead hares ear and photographed it for proof. Shortly after catching the first brown, I snagged on a stick and thinking it was a fish, set the hook and broke off both flies. I’m guessing a bad knot was the culprit. I decided to replace the Charlie Boy with a Chernobyl ant and the hares ear with a bright green caddis pupa. The Chernobyl would remain as my top fly for the remainder of the afternoon, and the bright green caddis pupa got switched out for an emerald caddis pupa half way through my remaining fishing. I landed an additional seven small browns, and the frequency of fish hooked or observed increased as I moved farther from the parking lot and trail. Casting was difficult in the small stream with tight overhanging vegetation, but flipping the foam Chernobyl helped quite a bit. All the fish caught were on the beadhead subsurface fly with roughly half taking the bright green caddis and the other half the emerald caddis. Just before 4PM the stream met the trail again, and I managed to catch a brown in a nice deep run and pool as I heard thunder and the sky grew ominously dark. I decided to quickly exit and walk back down the trail and change out of my waders before the next storm hit. By this time my hands were red and curled from the cold air temperatures. It was 42 when I checked the car thermometer. Before I could reach the car, the rain began to come down steadily and not wishing to get my clothes wet while changing, I threw my rod, wading stick and fishing backpack in the car, and drove back to Denver in my waders. I needed to take Dan to the airport for his trip to China, so I planned to fish close to Denver when I returned. I wanted to take advantage of the long hours of daylight and perhaps hit some evening hatching activity. 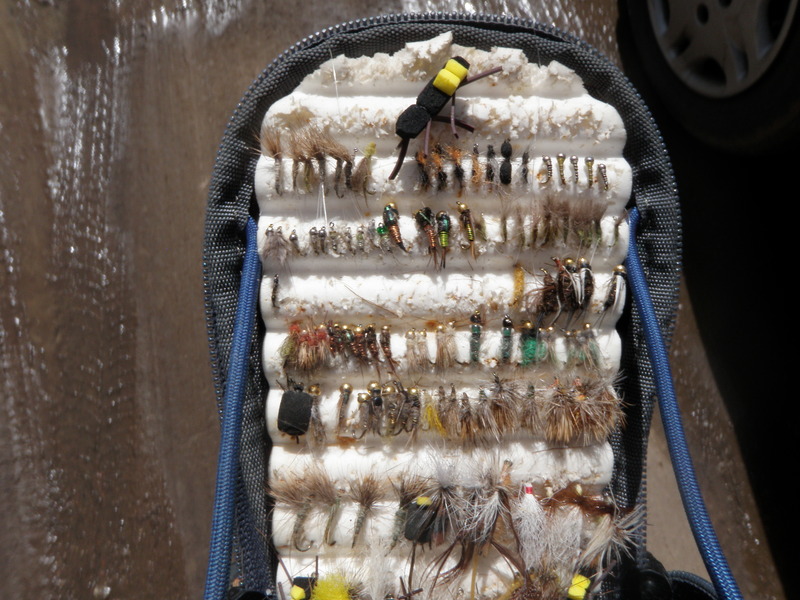 I used the time before driving Dan to the airport to gather my gear and tie five size 18 yellow body deer hair caddis. I felt these would more closely imitate the caddis that I captured on Bear Creek on Sunday evening. I arrived at O’Fallon Park and began fishing at around 5:30. Another fisherman was already working the water just upstream of the parking lot at the end of the park. I hiked above him and entered the water near the picnic tables just as I had on Sunday. I tied on the yellow caddis and almost instantly had a momentary hookup with a small brown in a slot behind a rock. Next I moved up to the nice deep bend run that goes against the Bear Creek Restaurant. Once again I had an audience. Initially an older gentleman from Texas observed. While he was watching a brown darted up and sucked in the caddis in the soft water on the left side above my position. I worked the deep center run and the seam along the far bank, but couldn’t entice any fish. I moved around the bend to the next nice pool and landed a small brown from the top of the riffle where it enters the pool. 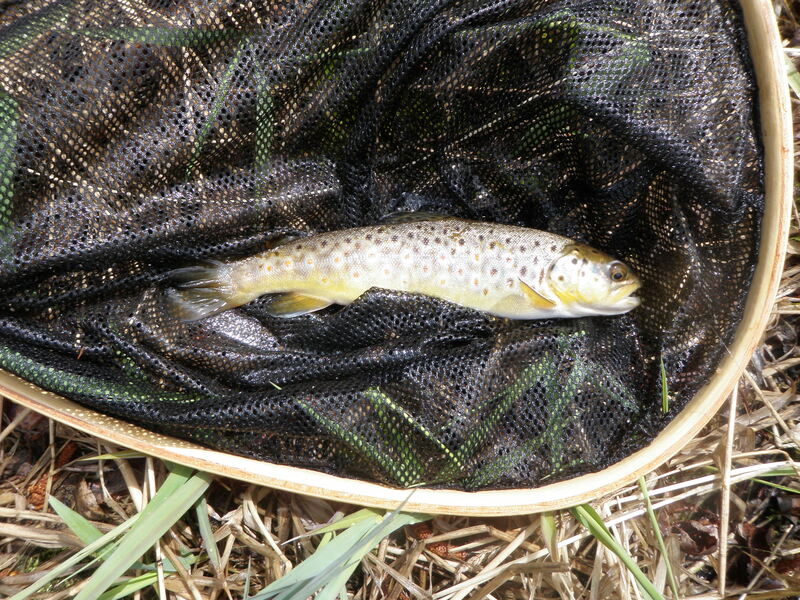 I continued working my way upstream and caught one more trout before approaching the nice long pool where I’d done so well on Sunday afternoon. 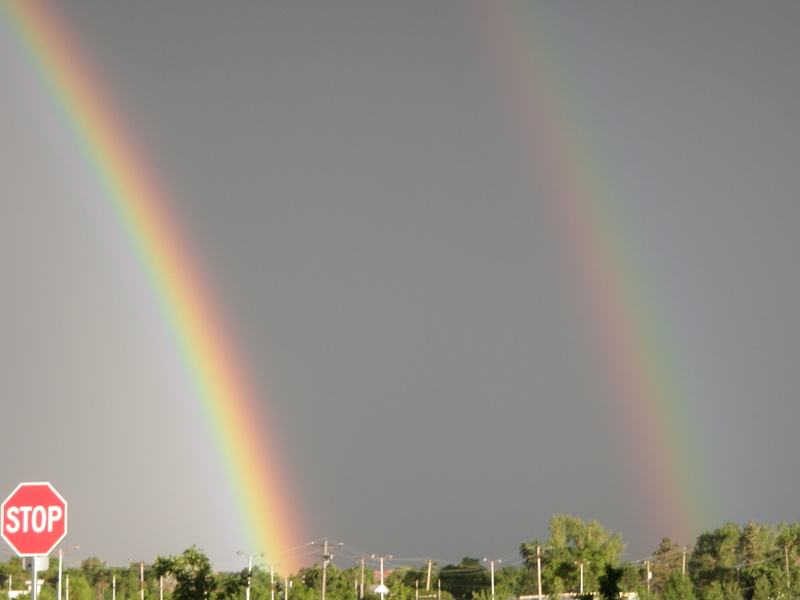 Dark clouds threatened a storm on several occasions, but nothing ever materialized. It was a pleasant evening with temperatures in the 70’s. Seeing no fish rising in the long pool, I switched to a Chernobyl ant trailing a beadhead pheasant tail. This didn’t produce either, but when I moved above the long pool I caught two additional browns on the BHPT and photographed one. I went under the bridge and fished my way up quite a distance, but again no success. I climbed up the short bank and hiked back down the road at around 7:30, then crossed the bridge and checked out the long pool hoping to see some caddis activity as dusk approached. Nothing was showing, so I continued down the path to the restaurant. A woman and two men were standing outside the restaurant posing for photos. They spotted me, and photographed me as I began fishing. On the third or fourth cast at the top of the riffle a nice brown darted up and smashed my yellow caddis. It immediately ripped out line as it dashed upstream then made a run back past me to the bottom of the pool while my spectators looked on. I dipped my net and landed a 12 inch brown. Where was the applause? Next I moved up to the nice pool around the bend. I’d spotted a trout refusing my fly several times previously at the very tail of the pool. It was a tough lie with a protruding branch a couple feet above where I need to place the fly. My first couple casts went to the right, but on the third attempt I dropped the fly just above the trout and below the branch. Bam. 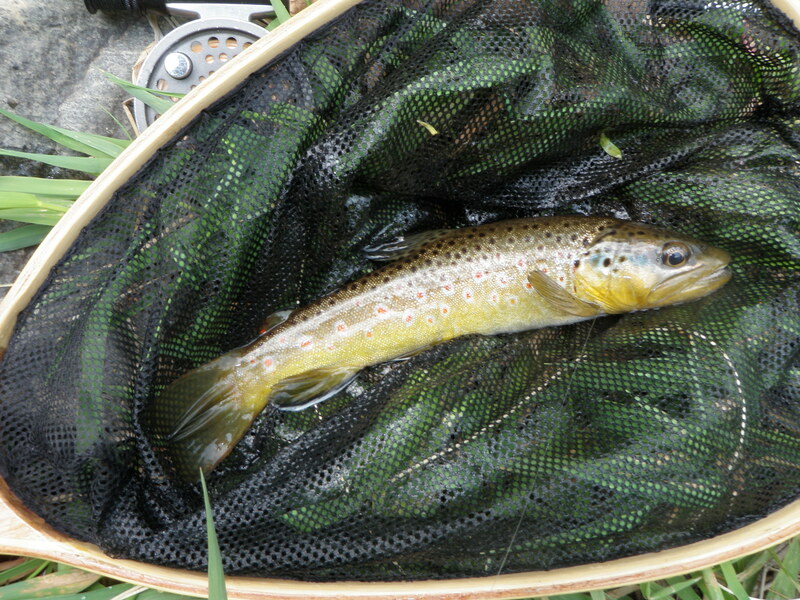 The small brown jumped on the yellow caddis, and I landed my seventh fish of the evening. Next I cast up to the very top of the riffle. On perhaps the fifth drift a trout tipped up and took the caddis. I set the hook, and felt weight a bit heavier than normal for Bear Creek, but it quickly turned and slipped off the hook. I went downstream a bit and made some casts to no avail, but it was now getting dark, and I was getting hungry, so I called it a day and returned home. Jane suggested we get away from Stapleton and thinking about houses (buying a house and selling our house) on a beautiful Sunday in late June. I tried to think of a spot not too far away yet close to the mountains. I remembered O’Fallon Park on Bear Creek where I’d fished without success in early April. Originally I thought we’d just drive there and read and snack, but then I checked the flows on my iPad and noticed the flows were only 62, so I threw my fishing gear in the minivan, and we took off. All the open space areas along Bear Creek were quite crowded on this warm afternoon on the weekend before the Fourth of July. We got to O’Fallon Park and entered the dirt road, then turned right and crossed the bridge and proceeded as far as it is possible to drive where we parked. I took out Jane’s folding chair and we hiked up the path that followed the stream upstream. There were a bunch of tubers in the stream directly across from where the car was parked, but they seemed to be confined to a small stretch. We encountered a large family picnicking along the trail after a short walk. We returned to the car, and I prepared to fish. Jane walked up the path with me to a nice shady area where she opened her chair to pause and read. I continued further upstream beyond the picnic tables and then entered the stream. I tied on a size 12 yellow Letort hopper and trailed a beadhead hares ear nymph. I worked some nice areas to no avail. The stream was crystal clear, but the flows were up, thus limiting to some extent the areas where fish could hold. But it was definitely in good fishing shape. After a bit I came to a nice area below a small island where the stream curved and went tight against a restaurant. The sky by now had clouded over and a man was standing outside the restaurant taking a smoke break. He told me the best fishing was near the island. The water next to the restaurant below the point of the island was very attractive…maybe 3-4 feet deep run and riffles. I spotted a couple rises and then some flashes to my hopper, but they didn’t take. There was a bunch of small caddis buzzing about along the trail and over the water, so I clipped off the hopper/dropper and tied on a dark olive body deer hair caddis. This got no looks whatsoever. The fish looked at my yellow hopper and wouldn’t take, but didn’t even show interest in the caddis. Perhaps a small yellow sally was the ticket. I tied this on and worked the attractive riffles while diners in the restaurant watched the action from the restaurant windows. One man opened the window to snap a photo of me fishing. I moved up a bit closer to the point of the island and cast so the yellow sally drifted in the seam where the currents merged and wham, a decent rainbow smashed the stonefly. The customer got his photo and a couple of kids in another window watched intently as I played and landed the 10 inch rainbow. Next I worked up the channel on the left side of the island and encountered a nice bend run with some soft water on the island side. I cast my yellow sally in the seam and landed four small browns in this area. I looked back and the two kids that watched me through the window had somehow crossed the small channel on the other side of the island and were now watching me catch and release fish from the island. While I was watching, an adult emerged and called them back over to the bank above the restaurant. Dark clouds continued to pass overhead with the occasional sound of thunder, but it never looked like it would rain significantly, so I pressed on. 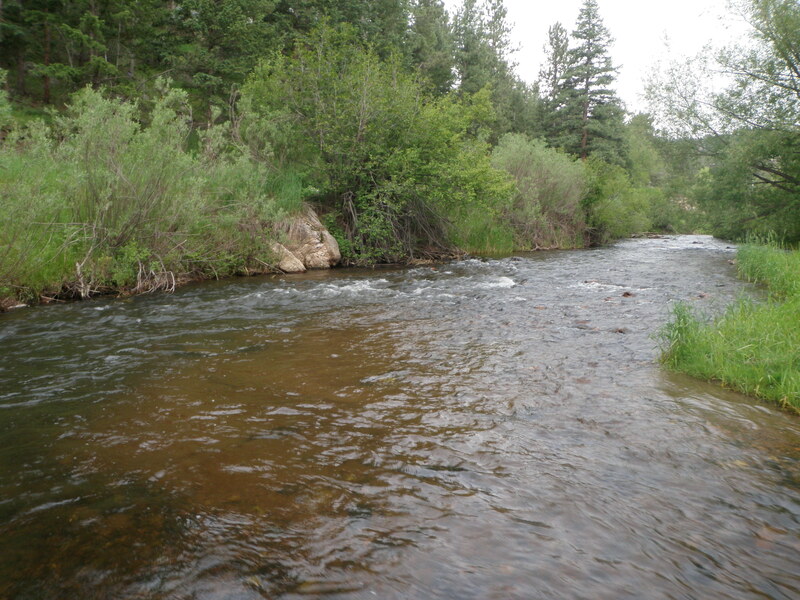 I picked up a few more small browns, until I came to a beautiful long run/riffle stretch of maybe 20 yards in length just below a bridge in the town of Kittredge. 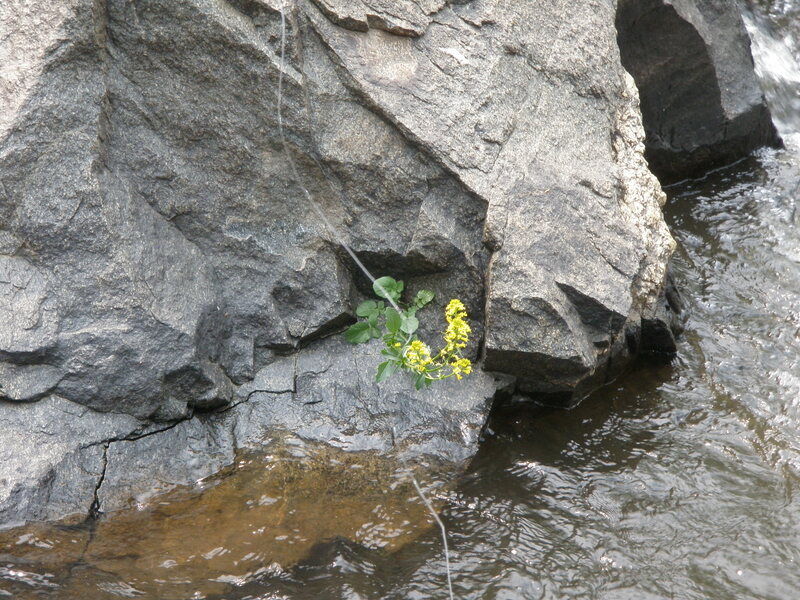 I spotted quite a few splashy rises in this water, but the fish were showing no interest in my yellow sally. I decided to clip it off and tie on a deer hair caddis. The caddis worked better than the yellow sally and I picked up a couple browns at the tail of the riffle area. As I was fishing a caddis landed on my hand and I picked it up and looked at the underside. It was mostly gray/olive, but had a light yellow abdomen. I had some caddis pupa like this, but no dries. I decided to try the deer hair caddis with the light gray poly body that I made for the Colorado River, and this turned out to be a good choice. I worked up the sweet 20 yard stretch and picked off another four browns that sucked in the light gray caddis. At around 5PM the rising activity slowed measurably, so I reeled up my line and returned to the parking lot where Jane was waiting in the car as it was cloudy and had chilled a bit. 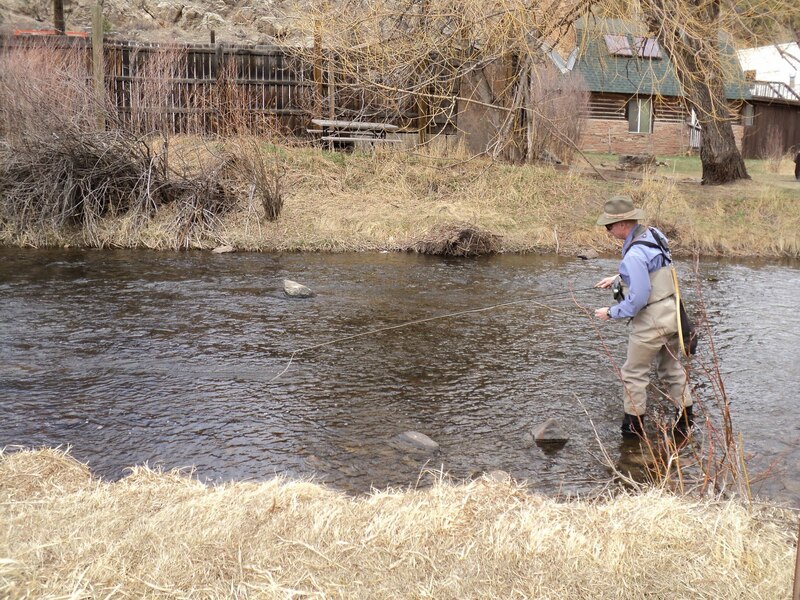 I read in the local Orvis newsletter that Bear Creek was a good early season place to fish in the Denver metro area. Temperatures were forecast to be in the upper 70’s on Tuesday, but I had a dentist appointment at 8AM, so I decided to try Bear Creek due to its close proximity. I’d fished Bear Creek once before on Labor Day several years ago and caught some small trout, but this was much closer to Morrison. By the time I returned from the dentist and packed a lunch and reorganized the flies in my fly pouch and drove to the stream it was 11:30. As I drove west on route 74 from Morrison, I noticed that the amount of snow along the highway was increasing rapidly with each 100 feet of elevation gain. I found O’Fallon Park easily and turned in the dirt road which led to a small cul de sac. The turnaround was so muddy that I decided to park along the right side of the road and not risk getting stuck in the deep mud. I ate my lunch and climbed into my waders and then hiked down the mud lane that branched off from the turnaround. The lane was a big oxbow that followed the stream around a hill and then came back to route 74. I stopped where the stream paralleled the road again and entered the water at a wide open area. I tied on a Chernobyl ant and trailed a San Juan worm and beadhead hares ear. 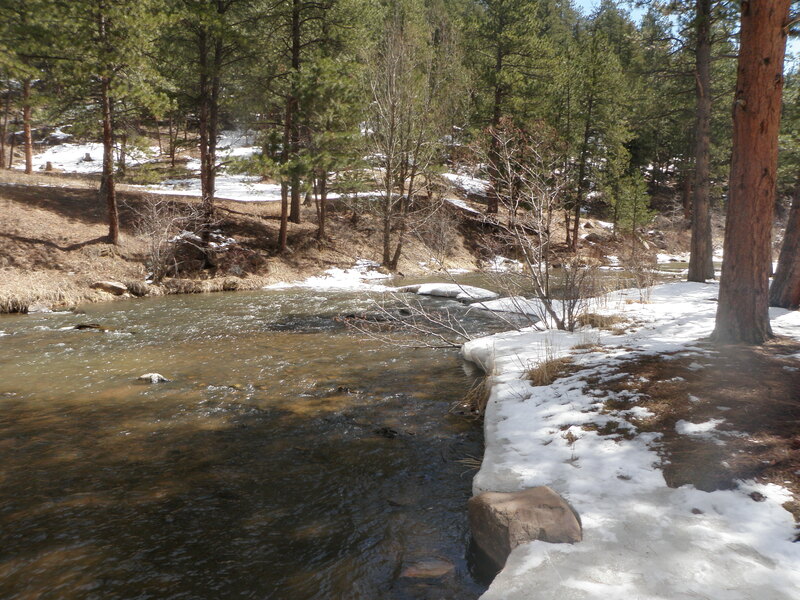 The water was flowing somewhat high and mostly clear but had discoloration from the rapidly melting snow. I worked my way through all kinds of water…riffles, runs, pockets and pools but experienced no success. I didn’t even spook any fish. When I got to a stretch where the stream narrowed and formed several nice deep pools with deep runs entering the pools, I switched to a deep nymphing setup. This didn’t make any difference. By 2PM I approached the top of the oxbow, and I’d lost all confidence. There was a man playing with four dogs in the snow and stream just ahead, so I decided to call it a day.